This evening myself and Dan went after some Thames bream, it had been planned all week but as with all best laid fishing plans work got in the way. We aimed to start at 2pm, we arrived about 5.30. We both feeder fished the same swim to get a lot of bait in the water quickly, maze based groundbait with worm & corn cocktail hookbait (to discourage the perch). Fishing was slow, as darkness was approaching it was just one small perch to Dan (the sweetcorn didn't discourage them that much). One last cast into the 'we should have packed up half an hour ago' produced a bite... 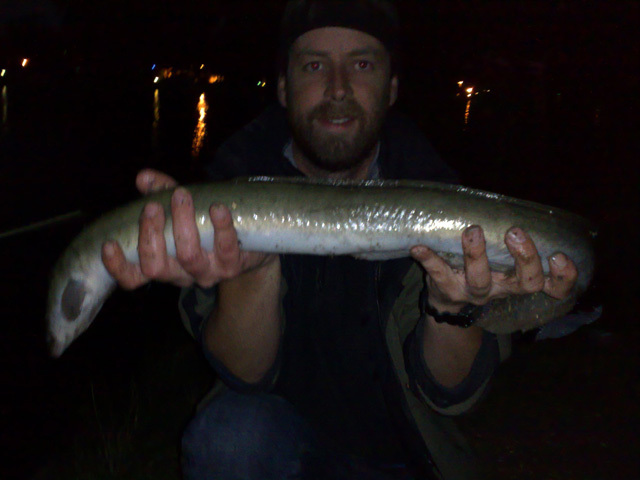 I presumed it was a bream, but had been told they don't give much of a fight, chub or small barbel perhaps... nope, nice big eel! 2lb 11oz a new PB, I was delighted as I was green with envy since Dan's big eel on Sunday. 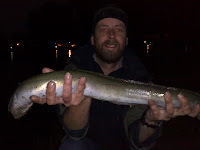 Sorry for the crap photo as it wouldn't stay still - we gave it a couple of attempts but as eels are really delicate fish I put it back without too much messing about. No bream, they'll have to wait for another day. <- Keep still! Also, I've added a personal bests page to the website here.